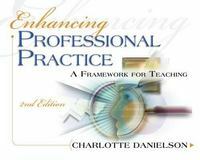 Enhancing Professional Practice 2 Edition The framework for teaching is a research-based set of components of instruction that are grounded in a constructivist view of learning and teaching. The framework may be used for many purposes, but its full value is realized as the foundation for professional conversations among practitioners as they seek to enhance their skill in the complex task of teaching. The framework may be used as the foundation of a school's or district's recruitment and hiring, mentoring, coaching, professional development, and teacher evaluation processes, thus linking all those activities together and helping teachers become more thoughtful practitioners.